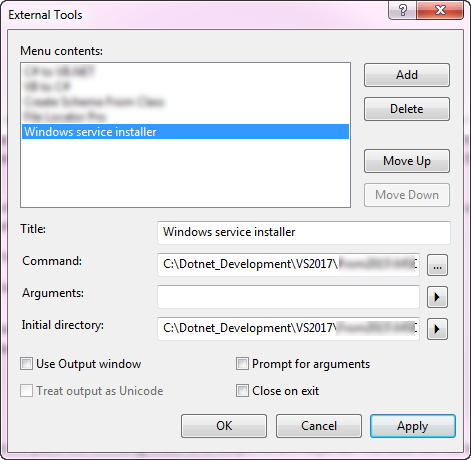 This article presents a Windows utility for interacting with a Windows service during coding phase for start/stop and install/uninstalling, get status of your Windows service rather than opening Visual Studio command prompt, typing in a long command for install/uninstall. Also demonstrates using a simple Windows Service starting a debug session. The following shows how to install a service using x86 InstallUtil.exe where the path in this case is from the author's machine and would change for you. Both commands would be placed into a separate batch file and executed from Windows Explorer. The following is an example that builds such a batch file for uninstalling a service (found within the solution source code provided). If the Windows service project location changes both batch files need to be updated. If the project Windows service project location changes working with a team, each developer may have a different folder structure which means each developer must update both batch files and if accidentally checked into source control this means any other developer who checks out the batch files must update them to their folder structure. 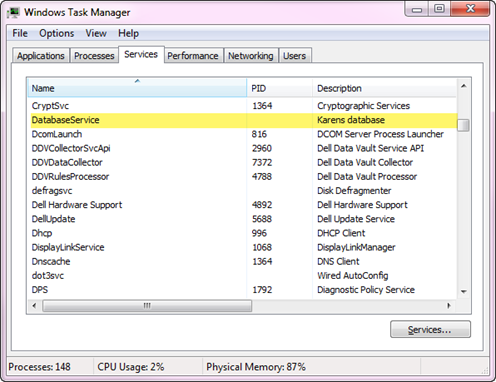 Open Task manager, select service tab, find your service and check the status. Below we can see the service included with the source code for this article. This is where this utility comes invaluable as checking status of a service, starting/stopping and install/uninstall are all handled by simple button clicks along with the service status in the form’s status bar. Copy the project to the solution folder of your service. Open app.config and update values as per below. Set ExecutableName to the executable name of your service. Set ServiceKnownName to your service name. To get the service name, single click on the service which pulls up the service canvas, select properties which shows the service name under the property Name. Set ServiceProjectFolder to the service folder, just the folder name as there is code in the class DirectoryExtensions to figure out where the service project is. Make sure SQL-Server is installed and running. In the class Operations, change the SQL-Server connection properties to match your SQL-Server install e.g. if SQL-Server Express is installed change the property databaseServer from the current value to .\SQLEXPRESS while if using a named instance use this. In the project KarenPayneService, run Createdatabase.sql and note lines 6 and 8 may need to change dependent on the path SQL-Server is installed. This example service works by time and when triggered will write to the SQL-Server database then recycle to the timer. Note a System.Threading.Timer is used, not a Windows forms Timer. If there are exceptions thrown they are written to the system events so make sure you have permissions to write to events as this code assumes you do as a developer. 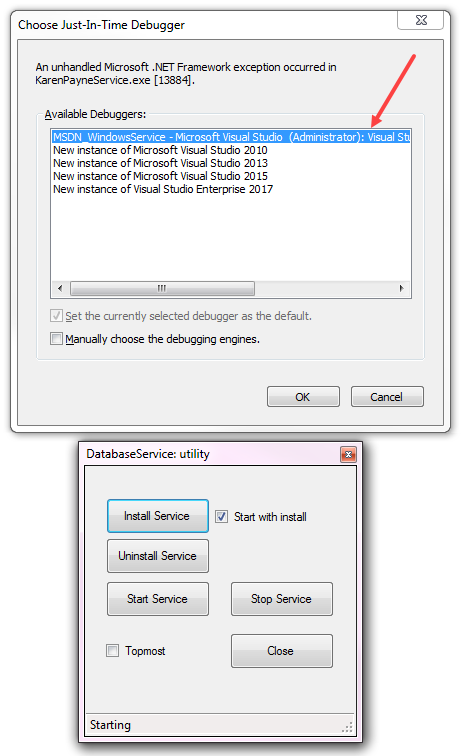 For installing (or installing without start service), start in Visual Studio and note the “Start Service” button and “Start with install” checkbox are disabled. Disabling these controls is done because if not disabled your debug session must start in a new instance of Visual Studio. When running the utility from Windows Explorer a prompt appears where one option is to debug with the current instance of Visual Studio which has your service project open. Note there is a checkbox at the bottom of the window when checked keeps the utility above all other windows which some developers may prefer so the utility is always available while others may find this unwanted. Rather than opening Windows Explorer to where the utility executable resides and clicking on it. Select the “…” button for Command, traverse to the executable folder for the utility and select it. Initial Directory to the path to the executable. Locate where to start debugging in code and place the following code, no breakpoints are required. This code will not execute when setup for release. In the screenshot below the "Install Service" button has been pressed along with checking "Start with install" check box. The following is where debugging will start. InstallUtil.exe creates a log which is a text file to examine for issues. Since this utility uses InstallUtil.exe it spans a command prompt where you can see what is going on during a install or uninstall so this coupled with the log file provides useful information. The following class provides methods to control a service. /// the service stopping outside of code. /// in a form statusbar. 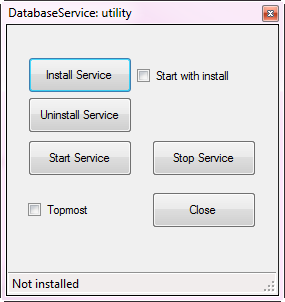 The following class provides methods to install/uninstall a service. /// A generic window service installer for install or uninstalling. /// we are working with, in this case database Service. /// Used to uninstall a service. Microsoft Visual Studio 2015 or higher (originally written in VS2015 and presented here using VS2017). Microsoft SQL-Server Express or full edition.